The original edition of The World as Will and Idea appeared in 1818, but in 1844 Schopenhauer published an expanded version. It contained the 'Criticism of the Kantian Philosophy', a lengthy document; and Supplements to the First Book (The Doctrine of the Idea of Perception) and the Second Book (The Doctrine of Perception or Knowledge of the Understanding). 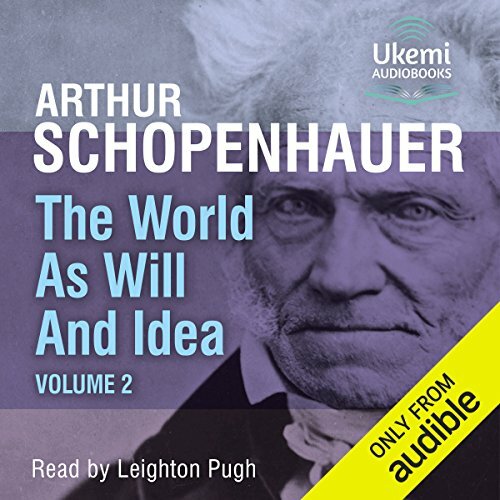 The original edition of The World as Will and Idea had been largely ignored, and for 25 frustrating years, Schopenhauer had to live with a feeling of failure, while remaining as acute, as challenging and as creative as ever. His decision to expand and build on his original ideas with the addition of the Supplements, clarifying and furthering his views, made his body of work even stronger. It was with this second edition that his reputation spread, and at last his standing as a major German philosopher of the 19th century was established. In this new volume, following the Kantian critique, are many essays, including 'On the Senses', On the Relation of Knowledge of Perception to Abstract Knowledge, 'On Man's Need for Metaphysics' and 'On the Primacy of the Will in Self-Consciousness'. Leighton Pugh again reads with the clarity and understanding that was praised following the release of The World as Will and Idea, Volume 1. Translation: R. B. Haldane and J. Kemp. Footnotes included. Volume I provided a coherent schema of all of Schopenhauer’s philosophy with a consistent system and with no mutually exclusive contradictory thoughts. Volume II amplifies and simplifies the thoughts laid out in the first Volume and can actually be read and understood without first having read Volume I. I’ve noticed Audible has the third volume now available and I will definitely listen to that sometime in the future. This volume is not as coherent the first volume was. That’s not a criticism. It’s obvious that Schopenhauer wants to explain his masterpiece to others because he believes rightly that he gave the fish the proper bait but they had refused to nibble at it. He’s blaming the fish, but in this volume he’s making the bait easier to digest. (Nietzsche said a similar thing in ‘Ecce Homo’ about ‘Beyond Good and Evil’ and to read parts of this book one instantly sees what inspired the early Nietzsche and even at times the later Nietzsche). There are many asides with in this volume. My first sentence above is a reworking of what Schopenhauer said in this volume about the ‘laws of thought’ and how they are all just variations of the law of the excluded middle. He really despises Hegel and there were about 10 or so insults (‘that kind of thinking only belongs in the insane asylum’, etc.) he directed at Hegel, and he disliked all of the German Idealist except for Kant. Kant’s ‘thing in itself’, the phenomena after space, time (successive events), and relative background is taken away is what Schopenhauer means by ‘will’ (to live), he’ll say. A baby has will but it doesn’t know what it wills (he said that multiple times). Our intellect is a slave to our will (that’s obviously a Hume sentiment, but Schopenhauer tends more towards Locke overall). Our will is our ‘inclinations, emotions, passions’ and feelings, that which makes up our character and is the unchanging part of the individual, he will say. He lays all these thoughts out in order to elucidate what he was saying in Volume I. Our unchangeable self makes up our will, he says. Kant will say ‘thought without content is empty, and intuitions without concepts are blind’. Schopenhauer bridges the ‘thought’ and ‘content’ with our ‘perception’. Perception is the glue that binds. Intellect (‘the head’) needs the will (‘the heart’) not the other way around. Our ideas are trumped by our feelings. There is the primal scream of the instinct that Schopenhauer calls for and he is clearly laying a foundation for Nietzsche. Also, Schopenhauer will expand on the cynics, skeptics and stoics schools presented in his first Volume, and his description of the stoics led to Nietzsche’s eternal recurrence of the now. (Nietzsche embraces the now while Schopenhauer knows our memories are convoluted with our memories about our memories (see Proust or just think about the madeleine you once ate!)). Freud claims to not have been influenced by Schopenhauer, but that’s hard to believe after reading this Volume or the previous Volume, because Schopenhauer clearly articulates what Freud will say before Freud! (Leibnitz, who gets quoted in this Volume multiple times, originated the unconscious mind with his ‘petit conception’, and Kant expands, but Schopenhauer runs with it until Freud owns it). Schopenhauer mentions how important Descartes is to modern philosophy. He also tells the reader where Descartes went wrong and contrasts Parmenides’ ‘the one’, i.e. thinking equals being and fits that into his ‘will as representation’. The mind/body dichotomy is a step towards the atomization of the world (Kierkegaard, Nietzsche and Heidegger all despise that way of thinking too). Schopenhauer thinks he has solved the problem by making ‘will’ ontological, the foundation of all metaphysics. Kant makes experience ontic. Hegel makes experience ontologocial. Our ‘will’ (to live) leads to our experiences. Schopenhauer definitely prefers the Kantian formulation. He ended the first Volume with Grace being the key to understanding and even dissing Pelagius in the process. Pelagius (and Erasmus) believed that prayers and praying would make a difference in the universe even with an All Powerful Necessary God. He ends Volume II with Grace too and how it’s necessary in order to give us freedom (it’s a literal end in the sense he saved it for the final paragraph). The German Idealist and Romantics were almost all Pelagiusians in spirit or at least thought time and our memories about our memories would act as Grace for us. Schopenhauer is most definitely not in that school of thought. Of all the philosophers who have a complete system, Schopenhauer is one of the easiest to follow. This Volume is his effort to make his system even more understandable.